Color(s): Black, fawn, brindle. Dark brown or black mask. Also commonly referred to as the Canary Dog, the Presa Canario's are believed to be descended from the cross breeding of the extinct Bordino Majiro and imported English Mastiffs. This breed was developed in the 1800's specifically for dog fighting. During the 1940's dog fighting was outlawed and the Presa Canario nearly became extinct. This breed was revived during the 1970's by Dr. Carl Semencie, an American veterinarian. A powerfully constructed breed, the Presa Canario is robust with a large head and chest. They exude an imposing presence and have a severe expression. They are agile, courageous, and unique. The Presa Canario breed has a deep, serious bark, docile with its family, but absolutely fierce and aggressive with strangers. Presa Canario's require a very dominant owner and is not recommended for first time dog owners. 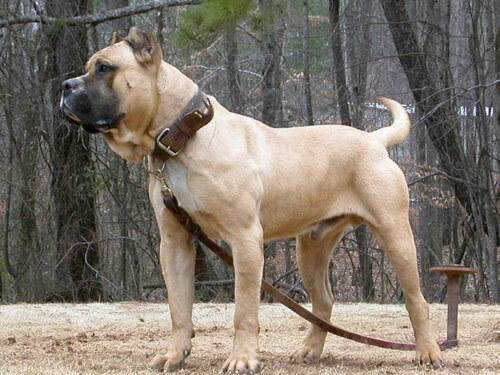 The Presa Canario can be highly dangerous if placed with the wrong owner. However, with the right owner this breed is capable of being a loyal and devoted companion. They make excellent guard dogs as they are protective by nature of their family and territory and will not hesitate to attack anyone or anything it perceives as a threat. This breed is not suitable for homes with children or other pets. Presa Canario's regular brushing of the coat with a firm bristle brush will minimize loose and dead hair. Bathing or dry shampooing should be done when necessary. Health problems associated with this breed are hip dysplasia, demodex mange, a diminished immune system, and eyelid problems. The Presa Canario has a short, flat, smooth single coat. The coat is coarse in texture, very fine, short on the ears, and slightly longer in length on the rear hindquarters and withers. This breed is an average shedder. Intense early socialization and obedience training is an absolute must. Presa Canario owners must be fair, consistent, assertive, and set firm limitations. Mutual respect is crucial. The Presa Canario breed is not recommended for apartment dwelling. They do best with a securely fenced yard or rural home. They are very athletic and enjoy daily exercise. The Presa must be securely leashed and muzzled when in public.